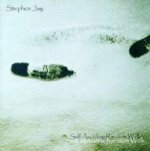 Stephen Jay's third solo release is a new step in the blending of abstract art-funk with it's own ancient roots. The rhythm section is the raw heart of the music, from the deliciously dark Friction, a glorious atonal blowout with insidious lyrics about power and what rubs against it, to the wandering, seemingly random parallel lines and ethereal interludes of the title track, Self Avoiding Random Walk. Grooves wide open in ardor and attack throb with enough flavor and funk to give an odd majesty to this music as it seems closer to discovery than interpretation.